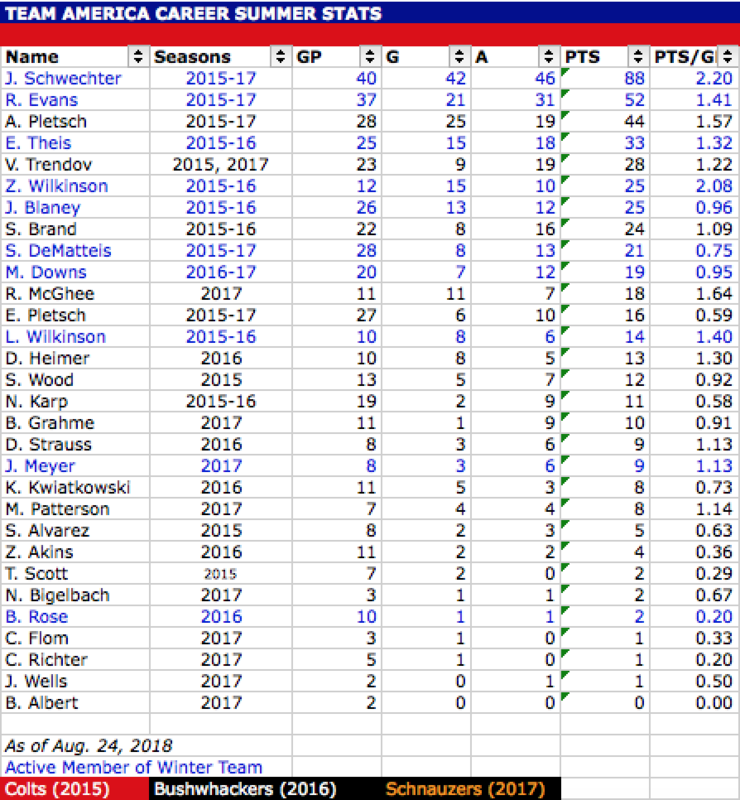 All records current as of the 2017-18 season. After a disheartening 0-6-0 start to its campaign, Team America bounced back in a big way—closing out the regular season with a 9-4-1 record to finish in third place with 19 points and earn the team's second postseason berth. The playoff run was highlighted by the team's first-ever postseason victory (7-4 over the No. 4 Chiefs) and a third place finish in the round robin. Four new faces joined the team in 2017-18 and each made an immediate impact, led by forwards Noah Sundberg and Sean Keane who finished the year No. 2 and 3 in goal-scoring and No. 2 and 5 in point-scoring, respectively. Captain America Justin Schwechter led the squad in all three major offensive categories for the second-straight season, including a team single season record 19 assists. Overall, 13 players finished with double digit point totals—the most in team history. 1. Miners: 15-3-2-0, 32 pts. 2. Summit: 15-4-1-0, 31 pts. 3. Team America: 9-10-1-0, 19 pts. 4. Chiefs A: 8-9-2-1, 19 pts. 5. Spartans A: 7-11-1-1, 16 pts. 6. Kodiaks A: 7-12-0-1, 15 pts. 7. Warriors: 5-14-1-0, 11 pts. 1. Summit: 3-0-0-0, 6 pts. 2. Miners: 2-1-0-0, 4 pts. 3. Team America: 1-2-0-0, 2 pts. 4. Chiefs A: 0-3-0-0, 0 pts. After its breakout 2015-16 campaign, Team America took a slight step backwards in 2016-17, finishing with a 7-10-3 record and narrowly missing a second-straight playoff appearance by two points. After starting the season winless through their first seven games, the World Police bounced back with seven wins in their final 13 contests and were unbeaten in six of their last eight (5-2-1). 1. Miners: 14-1-5-0, 33 pts. 2. Summit: 11-5-4-0, 26 pts. 3. Spartans A: 9-9-2-0, 20 pts. 5. Team America: 7-10-3-0, 17 pts. 6. Warriors A: 7-11-2-0, 16 pts. 7. Kodiaks A: 5-15-0-0, 10 pts. 1. Miners: 2-1-0-0, 4 pts. 2. Chiefs A: 1-0-2-0, 4 pts. 3. Summit: 0-1-2-0, 2 pts. 4. Spartans A: 0-1-2-0, 2 pts. 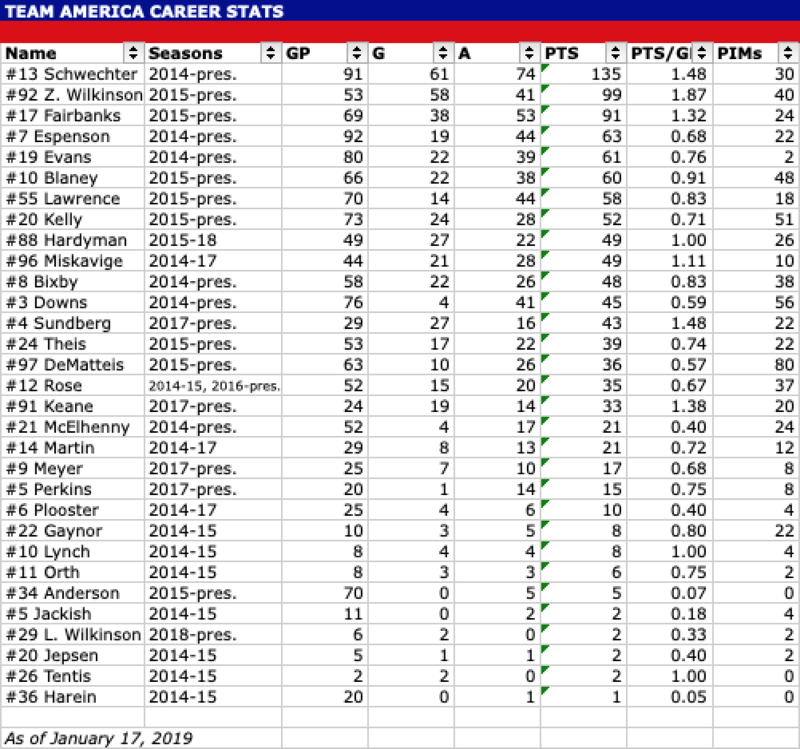 After a winless inaugural season, Team America turned the ship around in 2015-16, thanks in large part to a number of new additions. The World Police's roster featured nine new players, all of which made significant contributions. Team America went 14-4-2-0 and was in first place from day one until the last day of the season, when the Miners nipped them by one point for the regular season title. During the regular season, the World Police boasted the league's most prolific offense, scoring 121 goals (6.05 per game). An impressive seven players averaged a point per game or better on the season. Team America made the first postseason appearance in team history as the No. 2 seed. The World Police went 0-2-1-0 in the playoffs, finishing in fourth place. 1. Miners: 15-4-0-1, 31 pts. 2. Team America: 14-4-2-0, 30 pts. 3. Warriors: 13-5-1-1, 28 pts. 4. Chiefs A: 9-10-1-0, 19 pts. 5. Summit: 7-11-1-1, 16 pts. 6. Spartans A: 7-13-0-0, 14 pts. 7. Grizzlies: 2-17-1-0, 5 pts. 1. Warriors: 2-0-1-0, 5 pts. 3. Chiefs A: 0-1-2-0, 2 pts. 4. Team America: 0-2-1-0, 1 pts. Team America was formed in October 2014 as a conglomeration of AHA free agent players. It played its inaugural season in 2014-15 in the AHA 'A' League, finishing with a winless 0-20-0-0 record. The team was hampered all season long by poor attendance — often as few as just six or seven players — which contributed to a frustrating campaign that included 15 losses by five goals or more and five by 10 or more. Leading Scorer: Justin Schwechter, 26 pts. 1. Farmers: 15-4-1-0, 31 pts. 2. Summit: 12-6-1-1, 26 pts. 3. Warriors A: 12-7-1-0, 25 pts. 4. Miners: 11-7-2-0, 24 pts. 5. Spartans A: 9-10-1-0, 19 pts. 6. Grizzlies: 8-10-0-2, 18 pts. 7. Team America: 0-20-0-0, 0 pts. 2. Summit: 2-1-0-0, 4 pts. 3. Miners: 1-1-1-0, 3 pts.